Ah, I have conquered my June-years resolution: to watch all of the Christopher Nolan films. 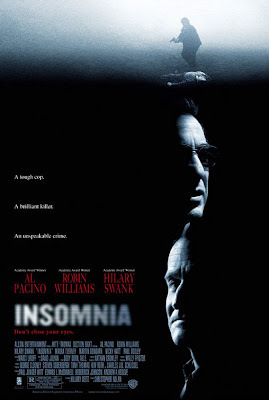 It was lucky that I got Insomnia for my birthday, as it is very hard to find in these parts of the country (the wonders of TradeMe, the best site to find the hard to find DVDs). I now feel like God. I have watched every single Christopher Nolan film, and every single one has entertained me through and through. When two LAPD detectives are sent to a remote Alaskan town to aid in the investigation of an alarming teen murder, they find themselves under the glare of the region's perpetual daylight. While closing in on the murderer, veteran officer Will Dormer's (Al Pacino) partner is killed, and the jaded cop is compromised by the calculated mind games of the primary suspect-a reclusive writer, Walter Finch (Robin Williams). Sleep-deprived and guilt-ridden over his role in his partner's death, Dormer must outmaneuver a brilliantly idealistic local cop Ellie (Hilary Swank), a brilliantly twisted killer and the brilliance of the Midnight Sun. While I still enjoyed this film, I felt it was rather distant from the Christopher Nolan I know and love because he didn't write nor co-write the film's screenplay. You can tell that it isn't his writing mainly because it doesn't accommodate the non-linear storyline that I have always loved in his work, and it doesn't use as many choppy cuts. However, you can still see some resemblance to Memento in this film, which is how it stands apart from over run-of-the-mill thrillers. This movie freaked the crumbs out of me. Mainly because I had an insomniac phase earlier this year (the most horrid time of my life), and I know partly how Dormer felt. It's so interesting how this movie highlights the fact that your mind is constantly playing tricks on you, and you can't tell whether it's your sanity or reality (hmmmm, sounds like Inception...). Another thing that creeped me out was the endless sunlight. How could I live in such a place like that? I may be afraid of the dark, but sleeping in sunlight at 1am?? Not for me. Al Pacino delivers a powerhouse performance in this, and makes the film worth the watch, adding to the suspense and realness of the film. Hilary Swank, also, delivers a good performance. Robin Williams...maybe I shouldn't have seen Mrs. Doubtfire before seeing this. I just can't take him seriously. He did make a fantastic effort in this film, and when his comedy career breaks down (very soon, by the looks of things), he should do some more serious stuff, because in time I could possibly take him seriously. But hey, this is a Christopher Nolan movie, so anything is possible, right?! A fantastic thriller with some good twists and turns, very creepy, but ultimately not one of Christopher Nolan's better films. But you know, it's up there. I imagine it will get better with a second viewing. Here's a Hollywood entry that doesn't live up to my expectations because I saw the original years before. As sinister as Robin Williams can be, as tired Pacino is tiresome, and I found myself degrading him next to Stellan's better version. That original film FEELS so right, too.